This Little Miss Sunshine chiffon cake is for my mummy friend’s girl turning one! It’s such a super adorable and endearing character that I enjoyed making. I hope it brings a smile to your face too! Both the Little Miss Sunshine character as well as the backdrop are made of chiffon cake. The sweet Sunshine is made from Lemon-Orange Chiffon Cake, while the backdrop is made from Pandan Chiffon Cake. My friend shared both flavors were loved and well-received! Thank God! She chose a green cheerful backdrop for the Little Miss Sunshine, so naturally we thought of using Pandan Chiffon Cake as the base. It’s a big 10-inch pandan chiffon cake using 10 egg yolks and 13 egg whites (I’m still not used to using so many eggs at a go!). Just scale the pandan chiffon cake recipe to 10 egg yolks (i.e divide everything by 3 times 10) and increase the baking time by 20+ min. For your convenience I have scaled it below. Baking time: 160°C 15 min, 150°C 10 min, 140°C 25 min, 130°C 20+ min. 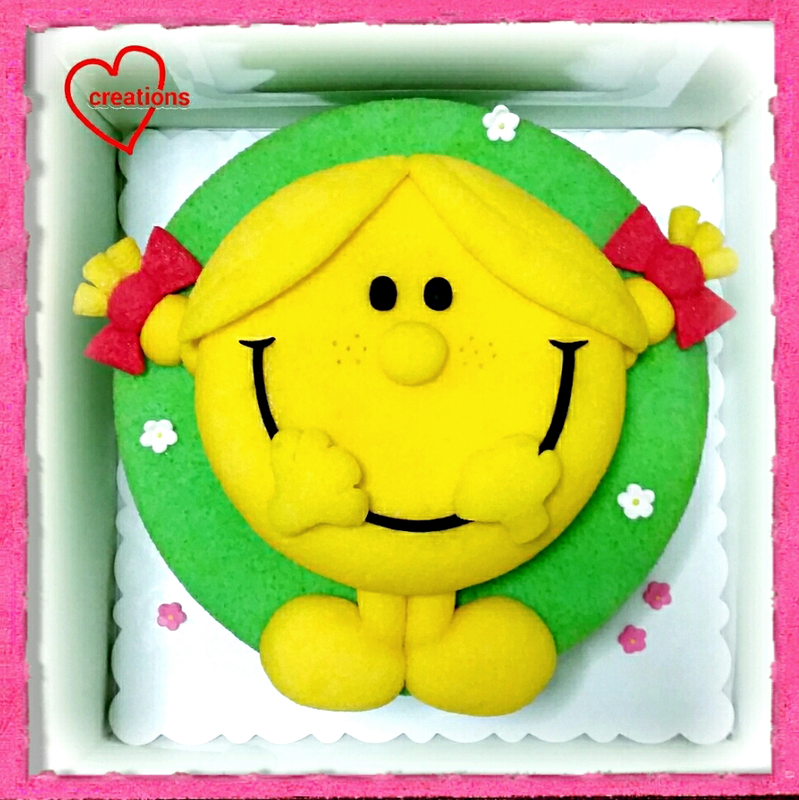 The Little Miss Sunshine is made from Lemon-Orange Chiffon Cake (recipe referenced from WAHM). I replaced the boiled water and vanilla extract in my Lemon Vanilla Chiffon Cake with equal parts lemon and orange juice, keeping the rest the same. Some orange also helps to balance the sourness of the lemon, and the combination was very well-received both by my family and the party :). I then divided the batter into a 7-inch round pan (for the face), thin layer cake (in 10-inch tray) for the hair, cake pop maker (for the braids), thick layer cake (for the hair strands at the ends), swissrolls (layer cake in 6-inch tray, for the leg) and round glass bowls (for the shoes). I rolled up the 6-inch layer cake into a swissroll for making her cute legs. For the rest, I had to do quite a bit of knife cutting and carving to get the shapes right especially the hands (took a long time!). The hair was made by wrapping the thin layer chiffon cake over the face and then making cuts along the lines. I made the freckles by using a chopsticks to poke holes in the chiffon cake. Lastly, I baked another 1 egg yolk charcoal chiffon cake (divide everything by 3) in a 6-inch tray to cut out the facial features and another 1 egg yolk strawberry chiffon cake in layer tray to cut out the bows. Melted marshmallows was used to glue everything together. Brush everything with syrup (sugar:water 2:3 ratio) to keep them moist. Thank God everything went well! Phay shing made some cupcakes for the party. Do look forward to them in the blog :). Happy birthday to Reiko Ariel!